BMW’s blue-and-white roundel has graced all sorts of machines in the past, from the tiny Isetta bubble car to the lardy X6 off-roader. But all have shared one feature in common – drive to the rear wheels. 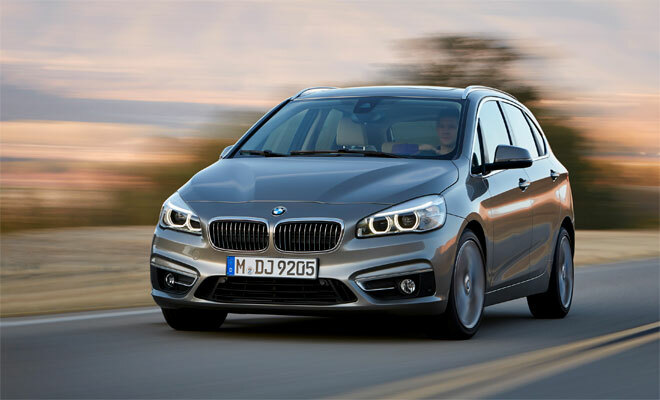 The new 2 Series Active Tourer is the first production BMW to pull rather than push itself along. Most other manufacturers have at least dabbled with front drive since Citroen’s Traction Avant pioneered the approach 80 years ago. When combined with a transverse engine, mounted across the nose, front drive liberates space in the cabin and eases assembly in the factory. As a result, the format has become the norm among smaller cars. Front drive also tends to be more forgiving when things get squeaky, being much less likely to spin into a hedge – though this advantage has been eroded by today’s active safety systems. On the flipside, front-drive asks a lot from one pair of tyres, potentially making loss of grip more likely. Putting drive and steering through the same axle also tends to rob the wheel of feel, and can even make a car try to steer of its own accord when accelerating. BMW apparently decided to join the front-drive throng after polling owners of its 1-Series, the only rear-wheel-drive compact hatchback currently on sale. Reportedly, four out of five drivers had no idea which pair of wheels were doing the driving. Most car manufacturers cut costs by sharing mechanical components across multiple models, and BMW has followed suit. The 2-Series Active Tourer (AT) has been pooled with the latest generation of Minis, which are of course front-drive BMWs wearing the fig leaf of another brand. The new Mini Hatch and 2-Series AT share the same underlying mechanical platform, called UKL1. The UK in the name has nothing to do with Mini’s British heritage, standing instead for Untere Kompactklasse, or subcompact class. The engines initially offered with the AT are also shared with Mini – a 1.5-litre three-cylinder turbo petrol seen in the Cooper and 2.0-litre four-cylinder turbo diesel from the Cooper D.
The 2-Series AT is a good deal longer than the new Mini, but the UKL1 platform will stretch out still further. The revamped Mini range has just gained a longer five-door hatch and will also get an even longer Clubman estate, while the 2-Series AT is likely to get a seven-seat stretched edition. A five-door 2-Series Gran Turismo, X2 soft-roader, four-door coupé and low-slung Touring estate would also be possible. 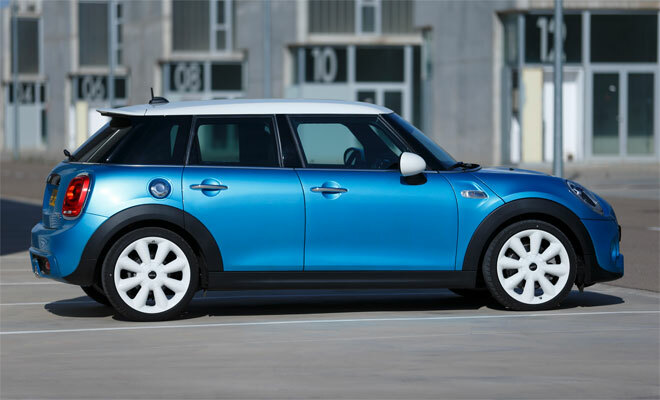 A smaller BMW to sit alongside the Mini and rival the Audi A1 is another likely spin-off from the same family of vehicles, though a car of that size would likely be badged a 1-Series or perhaps even a 0-Series. 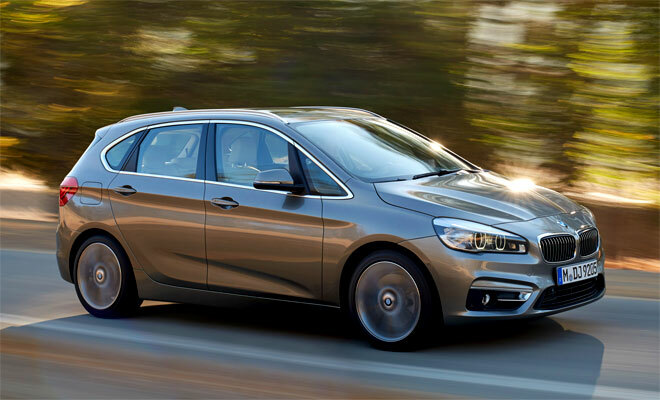 The least expensive car in the 2-Series range will be the 218i SE Active Tourer, starting at £22,150. 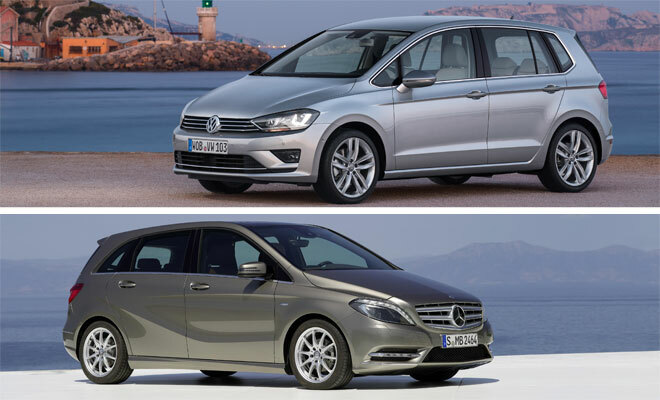 Direct competitors include the Mercedes B 180 SE, starting at £22,020, and the newly announced VW Golf SV in 1.4 SE trim at £21,580, making the BMW marginally the most expensive of the trio. Among less polished competition, a Ford C-Max Titanium costs from £20,855. Any worries about car maintenance for the 2-Series can be eased by purchasing an upfront package. A one-off £375 fee will cover normal servicing for up to five years and 50,000 miles, while a single payment of £1,280 will provide car maintenance by BMW that includes parts and labour over the same period. 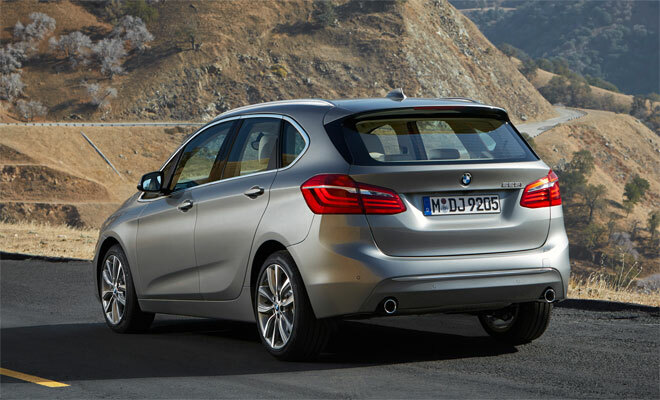 The full roster of BMW’s fuel-saving technologies has been applied to the 2-Series. All models feature stop-start, low-resistance tyres, battery charging during braking and part-time ancillaries like oil and coolant pumps, which run only when they’re actually needed. The driver can also select an Eco Pro driving mode to tone down the climate control and throttle response, potentially cutting consumption by up to 20%. The Active Tourer concept shown off at motor shows last year (and pictured above) was a plug-in hybrid and according to various reports that show-car promise is set to become a reality. The UKL1 platform has apparently been engineered with plug-in petrol-electric power in mind. This option is likely to combine BMW’s existing 1.5-litre three-cylinder petrol engine with a 40kW (53bhp) electric motor for a combined power output around 190bhp. The resulting plug-in BMW 2-Series hybrid would become a direct rival to the upcoming VW Golf GTE. The plug-in Volkswagen is expected to achieve a CO2 rating of 35g/km and will be able to travel about 30 miles on batteries alone. No doubt BMW will aim for similar outcomes. BMW’s Active Tourer disrupts the otherwise logical system of numbering only recently established among the company’s various models. Sensible saloons, GTs, 4x4s and estates all exhibit odd-numbered names, while less practical sports cars, convertibles and coupés all have even numbers. As the company’s first MPV, the highly practical Active Tourer ought to have slotted into the 1-Series, but apparently was deemed too big for that label. Hence it has a badge that now sticks out from the rest like a recently hammered thumb. BMW doesn’t use the term people carrier, but the Active Tourer is clearly of that ilk, with lots of options for juggling people and their stuff. The rear seatbacks are split 40:20:40 and can be adjusted for rake, while the seat base is split 60:40 and each part can slide to and fro independently. 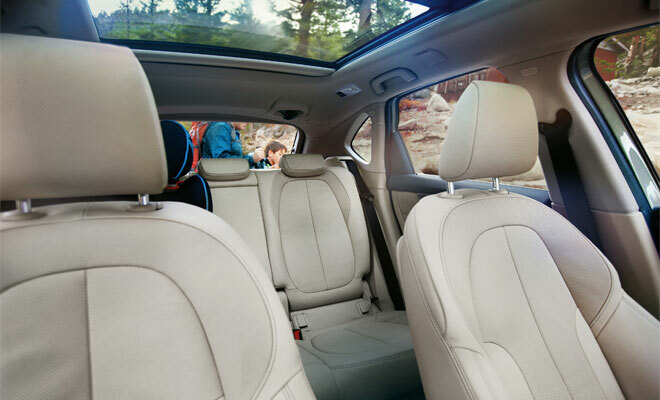 A fold-flat front passenger seat is also an option. A powered tailgate comes as standard in the UK, with optional foot-under-the-bumper operation. Inside, a split-level boot expands from 468 to 1,510 litres. Squint hard and the 2-Series AT might be a Mercedes B-Class. Or, indeed, the upcoming replacement for VW’s Golf Plus, the Golf SV. A ruler reveals exactly how close these three cars are. The BMW is 4,342mm long, 1,800mm wide and 1,555mm in height with a 2,670mm wheelbase. The Mercedes is 4,359mm long, 1,786mm wide, 1,557mm high and with a 2,699mm wheelbase. And finally, the Volkswagen is 4,338mm long, 1,807mm wide, 1,578mm high with a 2,685 mm wheelbase. In other words, the difference is no more than 21mm in any direction across the three cars. The German trio really couldn’t be much more like three giant peas in a pod – cars like the Ford C-Max, Renault Scenic and Citroen C4 Picasso are all taller and longer but show much more variation in size. As the first of the three to arrive, the B-Class has clearly defined something of a sweet spot for upmarket compact people carriers.